The Black Prayer Book, also known as the Prayer Book of Galeazzo Maria Sforza, is one of the richest and most sumptuous examples of its kind. Dated to the third quarter of the 15th century, it was produced in the artistic landscape of Bruges, in the Flanders region. With its 15 full-page miniatures, 24 small-format miniatures and 71 border vignettes, it is a testament to the artistic skills of the illuminator. Written in Latin, the Black Prayer Book contains prayers and devotional texts intended for private use. The manuscript is known with different names; thus, while one is clearly connected to its pages being dyed in black, the other takes after Galeazzo Maria Sforza, Duke of Milan, who came in its possession shortly after its completion (1466-1476). The manuscript iconography is mainly dominated by the use of gold and silver, which highlight and increase the luminosity of all the other colors applied. The elegant contrast between black tint and shimmering colors, is clearly visible in the superb full-page miniatures such as the four Evangelists miniature (fol. 32v.) where the room in which Mark, Matthew, Luke and John sit is surrounded by lavish borders on both sides. Colors such as gold, silver, green, blue and brown stand out distinctly against the black ground. Every page is decorated with marvellously detailed branches of acanthus, flowers, fruit and birds, and these highly decorated borders act as a enlightening frame both to the full-page and small-format miniatures which display an exquisite rendition of the three-dimensional feature. This effect is achieved by a few artistic means such as sparse hatching in gold and silver, and a few delicate rays of light. The text, written in gold and silver, is accentuated by silver and golden decorated initials as well as the line filler, making for the stern but elegant impression conveyed by the manuscript. The illuminator, until recent times believed to be Philippe de Mazerolles, shows great mastery of characterisation. The Black Prayer Book is a beautiful example of Gothic script, specifically Textus Semiquadratus or Semifractus, an intermeditate between the Quadratus and Rotundus. In this case, the letters have quadrangles only at the headline and not at the baseline. There is a predominance of uncial d with the sloping shaft, many of which fuse with the succeeding letter. The patron of the the Black Prayer Book was probably Charles the Bold, Duke of Burgundy (1433-1477), a powerful politician and lover of the arts. He was killed in an attack during the battle of Nancy, but his strong personality is still reflected in the manuscript, that, with its rare technique and costly material, echoes an exclusive aesthetic fashion typical of the Burgundian court. The codex later passed into the possession of Galeazzo Maria Sforza, however, it is still unclear how. 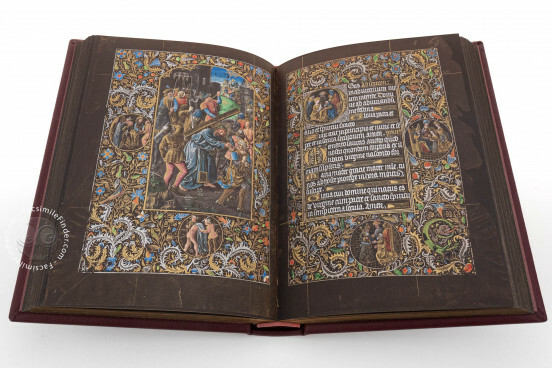 Full-size color reproduction of the entire original document, Black Prayer Book of Galeazzo Maria Sforza: the facsimile attempts to replicate the look-and-feel and physical features of the original document; pages are trimmed according to the original format; the binding might not be consistent with the current document binding. Red velvet with fittings and clasps. This is a partial facsimile of the original document, Black Prayer Book of Galeazzo Maria Sforza: the facsimile might represent only a part, or doesn't attempt to replicate the format, or doesn't imitate the look-and-feel of the original document. Red morocco leather; gilt edges. Red velours leather; gilt edges.